Welcome to virtual WGC2010 website. Virtual vWGC2010 starts on 2010-07-03 and it will last till 2010-07-18. Tasks will be scored either AAT scoring system or Racing scoring system. In case of AAT task igc or ftr files will be required. There will be 2 classes all together. Unfortunately only standard and world class is available in condor. Those two classes will be exactly the same in terms of task setting and as real as possible in terms of weather conditions. For each class there will be one server which will start at the same time as real. That means if real take offs start at 0900 UTC those server start also at 0900UTC. Keep in mind that those times are only for example. They will vary on each day. There will be also 3 timezones servers per class. First will starts at 1530 UTC, second at 1730 UTC and third 1930 UTC. Every server will be portected by password. Password will be send to you via email. Therefor you have to be registered to receive password and also briefing info. You can download WGC 2010 skin for gliders here . Diplomas for standard class winners. Everything went as it should. Score has been send servers didnt crashed. Some strange values were in score board but after validation everything event to normal. 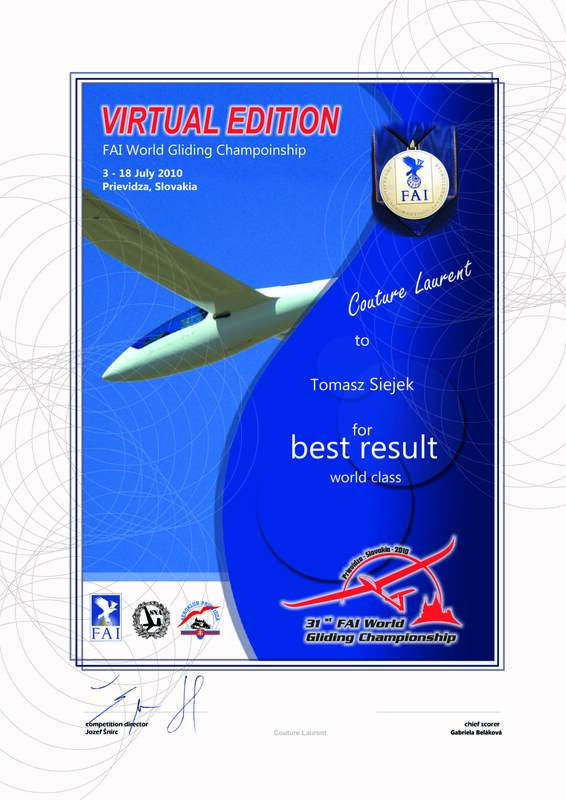 Today we will fly again but with regular timezones as it will be during competition. This will be again Training task. More information will be provided via email. No password for servers, again. Today at 1930 UTC I will start up all servers which will be used during competition. I will also store results to test how the system will work. Features which will be disabled are: Password on servers, chceking CN and pilot name and mid air collission penalty. We have got first practise day task. Fill free to try it. Officials are little bit optimistic about it but we will see how it goes. If everythink go well I will post results here on website. Winner of standard class is Rudolf Semo. 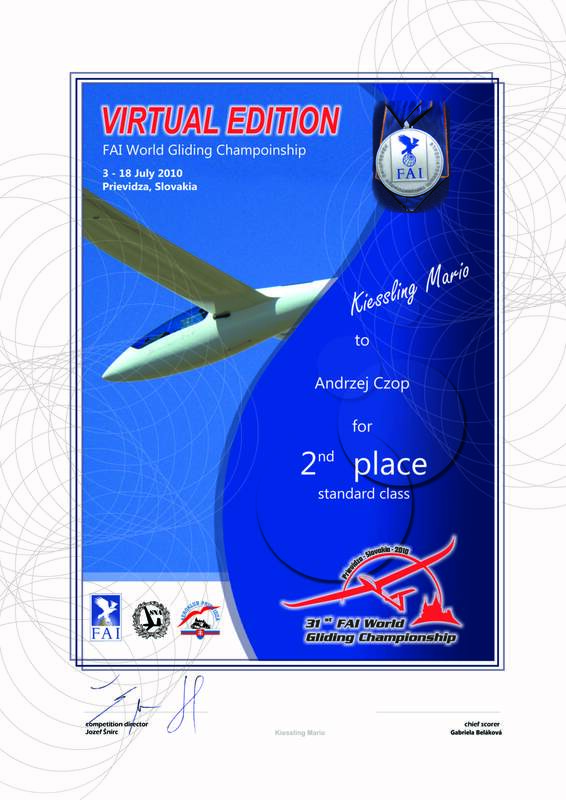 First 3 pilots will be awarded by diploma as was promised plus some small gift. Handicapped class is not valid due to small number of valid days. Therefor I will award Sean Churchill for best result with diploma singned by Sebastian Kawa winner of Handicapped class.